Originally designed to facilitate voice-to-voice communication on the move, the mobile phone is fast evolving into an entertainment and communication hub set to challenge the dominance of the home computer. When the train is heavily delayed, the mobile phone has proven itself as an indispensable device in calling or texting home to let them know you won’t be back anytime soon. However, with the modern mobile, you can not only keep in contact but also keep yourself amused while you wait. As mobile phones evolve into multimedia and multi-function communication devices, it won’t be long before delayed passengers everywhere can use their mobile to surf the Internet, check their emails, listen to some music, watch TV and even take pictures of other bored travellers. It seems the somewhat far-fetched boasts of Nokia, Apple, Samsung and Motorola, who claimed that it wouldn’t be long before you would be able to put a multimedia computer in your pocket, aren’t so fanciful after all. All manner of popular digital technologies – MP3 players, the digital camera, GPS, wireless Internet and even the TV – are being assimilated into the pocket-sized mobile phone one-by-one. These types of capabilities have existed in handy mobile form for some time, but as so-called ‘smartphones’. Once considered a different and specialised entity from the average text and talk consumer phone, these had limited appeal due to their chunky size and hefty price tag. Today, the boundaries between the two are blurring and feature-rich mobile phones are becoming increasingly mainstream. Sales of such multimedia devices are starting to overtake those of laptops, as the mobile phone begins to mount an increasingly formidable challenge to the trusty home computer. 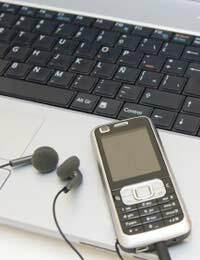 Some of the latest mobile phones – such as Nokia’s N86 and NTTDoCoMo’s 905 series – are now as powerful as laptops from 2000. Some experts believe that it might not be long before the PC and broadband are considered cumbersome and old hat, and the mobile phone becomes the multimedia hub of choice. When Nokia’s N96 phone was launched in September 2008, it heralded the mainstream consumer mobile’s move towards leisure by being marketed as an ‘entertainment’ phone. The device boasts a 16GB memory, built-in 3D sound, 2.8 inch screen and a digital TV tuner. However, the ubiquitous multimedia leisure phone is still a few years away. At present, most mobile phones on the market tend to specialise in specific features, such as the Internet, music or photography. Nokia, for instance, sold nearly 200 million camera phones and 146 million music phones in 2007, and looks to follow this success with GPS-enabled phones, as personal navigation becomes the next feature to be adopted by the mobile. TV viewing is also another activity that is due to hit the mobile phone in a big way. Users of the iPhone, iTouch and the Nokia N96 were among the first to be able to watch BBC TV on their phones using the BBC’s iPlayer, which allows UK audiences to download and stream BBC TV and radio programmes up to 7 days after their original broadcast. Although games have been available on mobile phones since the mid-1990s, they have yet to set the world alight. However, some experts believe that with the introduction of such capabilities as 3D graphics acceleration and specialists like Nyidia entering the market, this will soon change and gaming will prove another big feature of mobile phones.